You have added Bursts of Beading Embellished V Dip Maxi Dress in Jade into shopping cart. This pretty maxi dress features whimsical bead and colored rhinestone embellishments at the waist. The Bursts of Beading Embellished V Dip Maxi Dress is fully lined to the mid-thigh. It has a strapless neckline with a V dip in the center and a lightly padded bust for support. The empire waist is embellished with clear beading as well as colored stones, giving it a whimsical and fun look. The attached skirt has a full length maxi cut. An exposed back zipper completes this dress. The Bursts of Beading Embellished V Dip Maxi Dress is perfect for any formal event. It can also be dressed down with flat sandals and a boho headband for a laid-back vibe. This is a cute dress to pack on vacation! Details: Lined to mid-thigh. Lightly padded bust. Exposed back zipper. 100% polyester. Lining: 100% polyester. Dry clean only. Small measurements: Length from top of bust to hemline: 53". Bust: 32". You have added Bursts of Beading Embellished V Dip Maxi Dress in Jade into Wishlist. You have added Bursts of Beading Embellished V Dip Maxi Dress in Jade for Stock Notification. 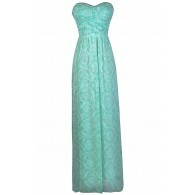 You have set Bursts of Beading Embellished V Dip Maxi Dress in Jade as a loved product. You have removed Bursts of Beading Embellished V Dip Maxi Dress in Jade as a loved product.